Thursdays from 6:15 pm until 7:30 pm. On Thursday evenings, the Academy offers auricular acupuncture treatments in a safe and comfortable group environment. The suggested donation is $5. Veterans and their immediate family members are treated free of charge. Please bring your DD214 or your VA ID with you. There is no charge for this treatment, though donations are always welcome. No appointments are necessary. Simply arrive at our clinic by 6:15pm on Thursday evening and let us know that you’re here for Community Clinic. Treatment is provided on a first-come, first-serve basis and takes about half an hour. What is auricular acupuncture and what should I expect? 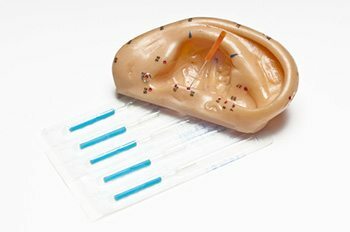 Auricular acupuncture refers to the system of treatment using only the acupuncture points in the ear to treat chronic conditions and symptoms across the entire body. When you arrive, a practitioner will check in with you, then place several needles in each ear. Then all you need to do is sit and relax while the needles do their work. Your comfort and health are our first priority. We ensure that our practitioners use high quality stainless steel, individually packaged, pre-sterilized needles. These needles are for your treatment only and then disposed of. Needles are never reused. The Academy is a 501(c)(3) non-profit organization. The clinic welcomes donations to support our efforts. For more information, please contact the school directly at 352.335.2332.